JVC seem to have found the perfect complement to your shiny new HDTV – an iPod dock! Simply buy one of their new JVC TeleDock range of HDTVs, and you too can dock your iPod into the front of your telly, where it’ll be fully charged and happily play music, videos and photos through your TeleDock’s screen. Actually, although this seems like an odd idea at first, it makes a lot of sense for people who’s lives centre around the iPod or iPhone. You can control your iPod through the TV’s remote, which has a similar look and feel to it, and watching videos or photos on your HDTV is much better than staring at your iPod’s screen. The Teledock TV’s themselves aren’t super-high end, so the iPod dock is the feature, not the quality of the picture. That said, they do offer full HD, 120Hz refresh rate, as well as digital noise reduction, dynamic backlight, three HDMI connections and 1080 24p/30p output. Oddly, their speakers only have a 10W output, which is a bit weedy, particularly when their main use is to play music from your iPod! 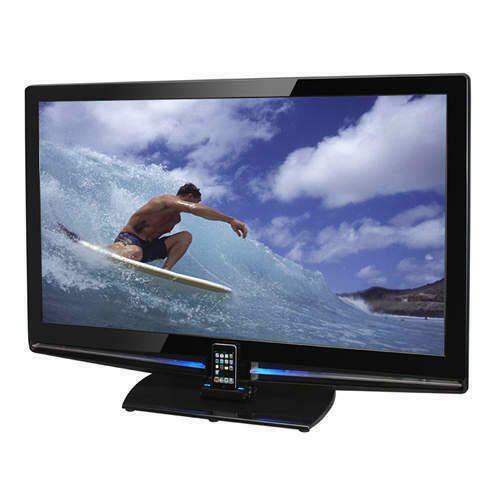 The three JVC TeleDock TVs’ release date is set for Spring 2010, with the TV’s coming in a range of sizes from 32″ to 46″. JVC launches iPod TVs, world says WTF? !